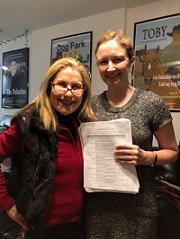 I’m so excited that my NYU student, Marybeth Diss completed her screenplay! It’s a funny, original romantic comedy, which is the most difficult kind of story. Her first draft was amazing: well-structured, well written and has great, memorable characters. She confided that it was the first thing she’s ever completed! Since I’m usually working on a dozen or more projects and must be full of ideas for each one, I keep a little notebook, and when I get an inspiration, I write it down. Later I try to expand the idea into a three-act version of itself to see if it has legs. Then, if it does, I can determine whether the idea’s best used for a script, an episode of a series, a limited or traditional TV series, etc. This is not a random process: I have several sections in that book, which include bits of overheard dialog or scenes, characters and story ideas. I often have no idea where I’ll use something but always get a physical thrill that clues me that there’s something important here. I also take photos that will remind me of that idea later. 1/19/19 Character- an elegant, slender 80-year old self-described “preacher” who believes that faith with humor is the secret to a good life. “I had stage 4 cancer, but when I discovered my faith, I was able to crucify it.” She laughed. She wears sunglasses – what are her eyes like? Please start to build a body of work and share how you’re doing it.